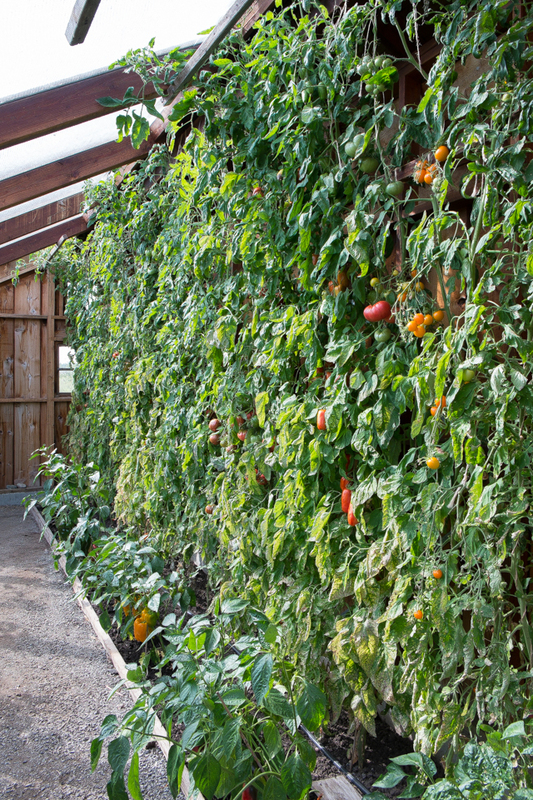 The tomato vines have reached the top beam of the ten-foot-high greenhouse and the ripening tomatoes are shining red, yellow, purple and striped against the green leaves. 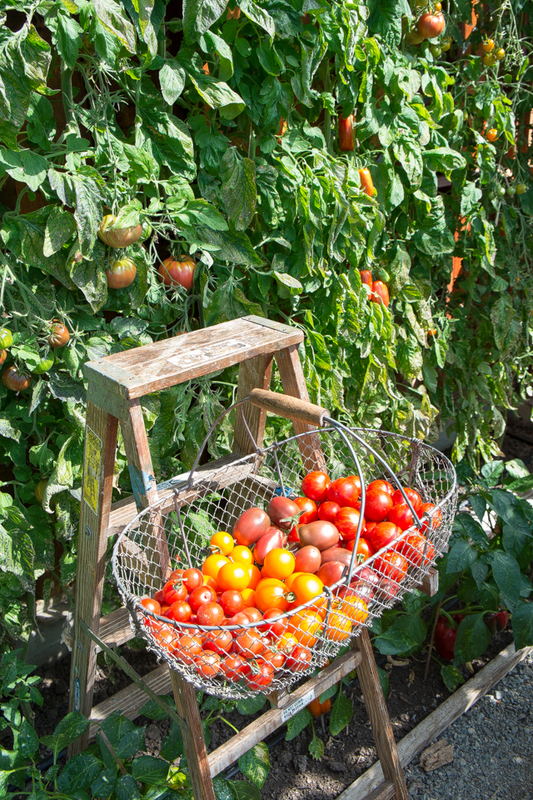 Since mid-July we’ve been keeping up with the harvest, enjoying tomato sandwiches for lunch and a plate of sliced tomatoes or various fresh or cooked sauces for dinner, but now the later varieties are coming on to join the abundant earlier varieties and there are more ripe tomatoes than we can eat in a day. It’s time to start drying them. I could can them but drying is so easy that I return to it every year. Slice the tomatoes about three-eighths of an inch thick, arrange them on the drying racks, turn on the dehydrator to about 130 degrees and six to eight hours later there are dried slices of intense tomato flavor ready to drop into jars, one per variety with room left to add more, and store them in the pantry. No blanching, no peeling, no packing into hot jars and processing in boiling water. And they are just as easy to use in the kitchen. For a quick tomato sauce, I pour boiling water over a cup or so of dried tomatoes, let them soften and then process the slices and liquid in the Cuisinart. For a tasty tomato spread, I use less water to rehydrate them and process them into a thick paste. Snipped into slices with scissors, they give welcome tomato flavor to sautéed greens, beans, egg or meat dishes. The other day I picked a basket of smaller-sized tomatoes, Red Velvet, Sungella, Ukrainian Purple and Darby Striped, all new varieties I’m trying this year. I sliced the Red Velvet, a cherry tomato, in half, placing them skin-side down on the drying tray and trimmed off the stem and the tip ends of the others then sliced them into three or four rounds, depending on their size, before arranging them on the tray. 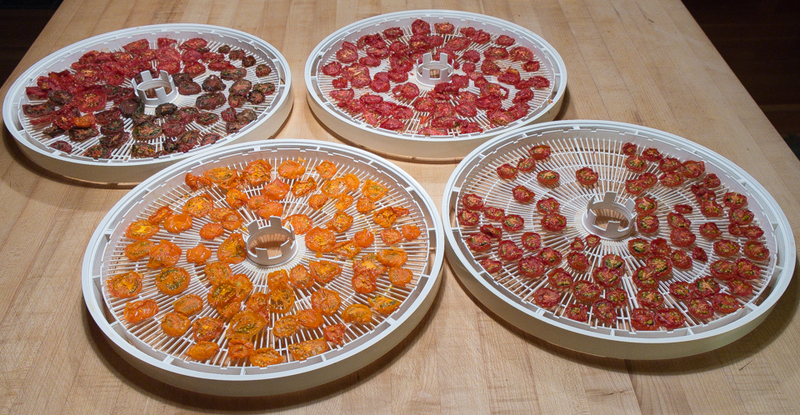 The cherry tomatoes took longest to dry; the others, with skin only around the edges, dried more quickly. I start checking them after five hours and pull off any that are dry to the touch. If they reach the crisp stage, that’s fine but the slightly flexible, dry slices store just as well. The next day, I picked some larger tomatoes, Black Sea Man, a new one for me this year, and Amish Paste, an old favorite, and followed the same method I used for the smaller round tomatoes. I’ll dry just about any tomato, but my favorite candidates for drying are Sweet Million cherry tomato, Amish Paste and Speckled Roman, in part for their sweet/tart flavor and in part because of their dense flesh. Of the new tomatoes I tried this year, small, round, flavorful Darby Striped also seems to be a good candidate for drying. Juicier, seedier tomatoes, like Black Sea Man, dry well too though I admit that they are probably better peeled, seeded and slowly roasted then cooled, put into jars and frozen. Drying is still my favorite tomato preservation method but roasting is a close second. Canning, though, remains a distant third. 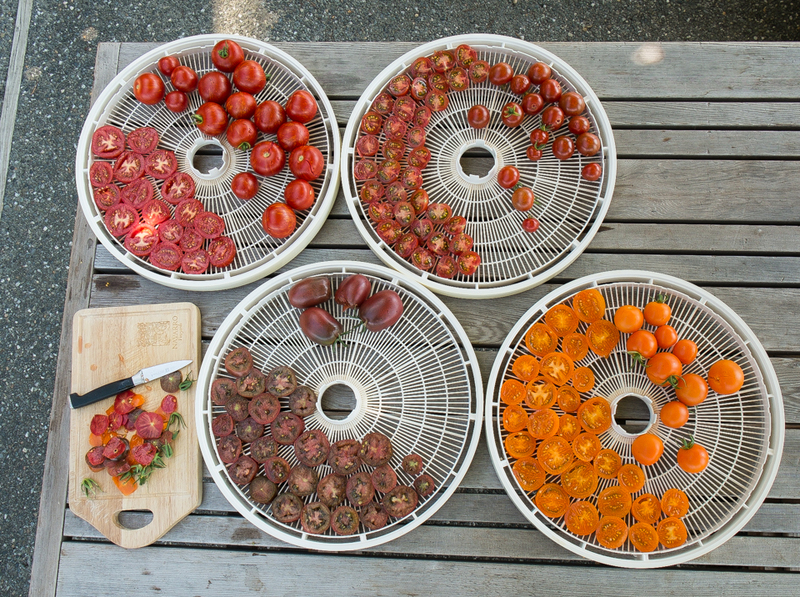 This entry was posted in Summer Vegetables and tagged Drying tomatoes, How to dry tomatoes, How to store dried tomatoes, Tomato varieties for drying by Lopez Island Kitchen Gardens. Bookmark the permalink. It was wonderful to see you and Scott in August. I am enjoying reading your blog and look forward to seeing you in the fall in San Diego.